My apologies now, because I have so many pictures, and limited time, I decided to break my post up into a few. With Cami sleeping, I had better get started on our trip! A few months ago, Mark and I started talking about taking a vacation before the baby arrives. We decided to go to San Diego over Easter weekend. A few weeks ago, I found out that a very close friend of mine was going to be through the temple! She has worked so hard for this, and I really wanted to be there to support her. Mark was awesome and let me change our plans, and go to Utah instead. I bought Mark a plane ticket so that he could fly up later in the week and spend some time with us, and this would help him not miss so much work. Our trip started out Thursday March 17th! 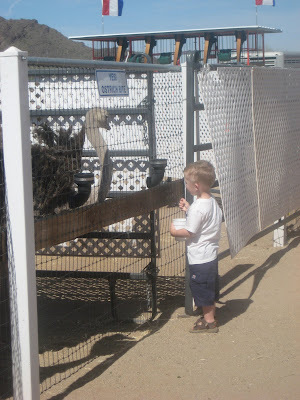 My friend's kid was out on spring break and so I invited her to the ostrich farm just outside of Picacho Peak. We met there and had a great time! 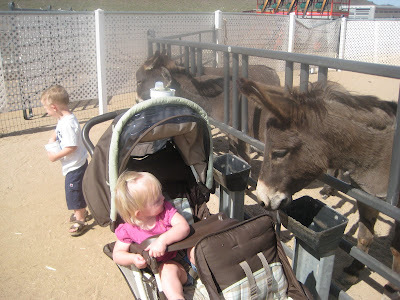 Cami was so funny about the animals. She did not like them being so close to her!! Grant was a different story. This kid can run through the Tucson zoo in 15 minutes, no exaggeration! This kept him a little busier, but he still ran from one thing to the next. At one point he ran into someone else's family picture. I felt really bad, but they poke a joke about the son they never had (they too had blond hair and blue eyes). Again, Cami was not sure about these strange new animals. 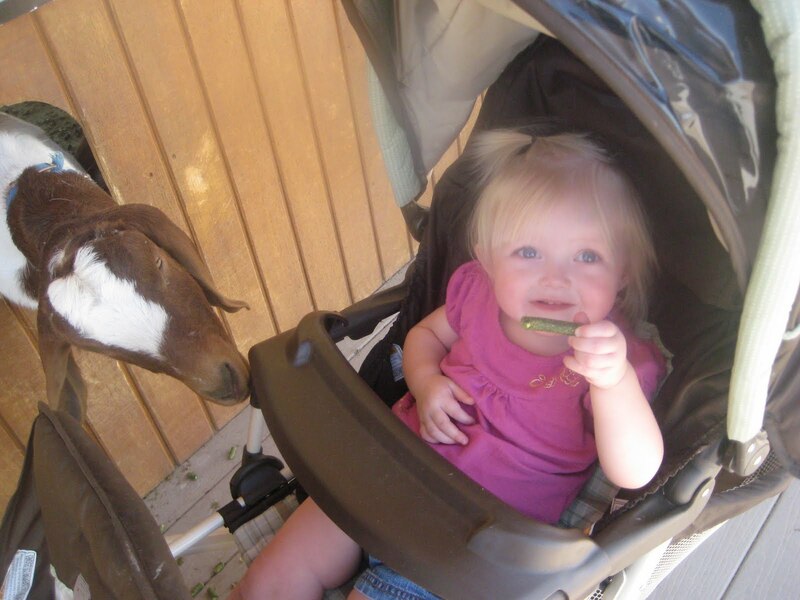 She did finally feed the goats, but it didn't last long!! The last part of our day was spent in Picacho Peak Park. I have MANY memories hiking this mountain when I was little. We had a picnic and let the kids play on the play ground... Ironically, the same ones I use to play on, they haven't changed them!! We were able to take a hike up to the kids "cave". I'd have to say, it was a pretty fun afternoon, and I know the kids LOVED it too. I would suggest stopping by and feeding the animals, pretty good entertainment for 5 dollars!! I totally love the park at Picacho Peak! It was on those swings that mom looked at my scalp and told me that I had lice...I had been itching like crazy. What a memory I have to associate with that place. I am super jealous over the bright sunny sky! It looks like it is warming up. Before you know it, summer will be in full swing, and I can't wait! I love you, you cute little mamma!!! I remember you guys taking us there when we visited! Wow, still looks the same. I think that is the place where we did some of our "disappering" acts on camera. Do you remember that? A day in the life of... me!